Search engine optimization (SEO) is key if you want to reach as many candidates as possible with you job advertisements. Yet, SEO can often be a roadblock for many recruiters who aren't quite sure how it works. In this article, we will explain how to optimize your job ads for SEO and why it might actually be a lot easier than you think. Keyword research is always the first thing you should do when optimizing your job ads for SEO. The purpose of keyword research in the context of job ads is to determine what job title your target group of candidates is actually searching for. For example, let’s say you want to post an ad for a job that you are calling “Digital Marketing Guru” internally. If you take the time to do the research, you might find that calling the position “Online Marketing Manager” will have a bigger reach and a better response rate. What you shouldn’t do is pick a title that misrepresents the position. Ultimately you want to find a happy medium between the internal title for the role and the title most searched for by your target group. 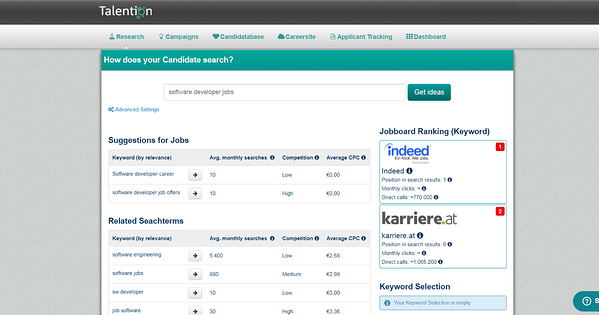 The next step is to make sure that your keyword is used in the most important places in the job ad. Your keyword should appear in the URL, page title, meta description, and should also be found throughout the page text. Now, if we’ve lost you a little bit here with the marketing jargon - don’t worry. Just take a quick look at the examples we’ve included below for a better understanding of where the keyword should be appearing. Many candidates are now looking for jobs while they are on the go, which means they are probably searching on their cell phone. To make sure that you don't lose these candidates, its essential that your ads are optimized for mobile. A crucial part of mobile SEO is ensuring that the job ads are created in a way that looks good and can still function correctly on a small screen. The text should be readable, images should look normal, and in the best case scenario, candidates should be able to fill out and submit an application. If you’ve gotten to this point in the article and you’re feeling overwhelmed - fear not. We have some good news for you. Optimizing your job ads for SEO actually doesn’t have to be difficult. In fact, with the right help, it can be done with just a few clicks. The easiest way to ensure that your job ads are SEO optimized is by using a SEO tool. 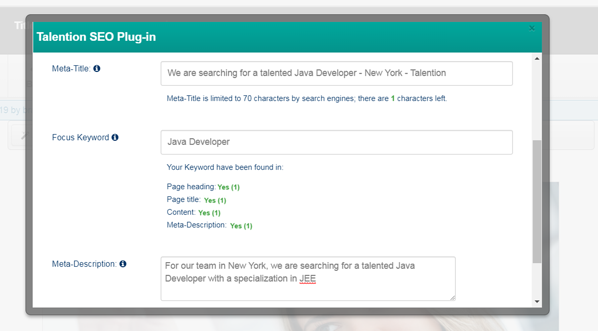 For example, keyword research can be made quite simple via a tool that is integrated into your recruiting software. This way all you have to do is enter in the title you want to use and you will be given related suggestions that may be more advantageous in reaching your target group. A SEO tool can help you to add your keyword to the page title and meta description while you are putting together the job ad. All you need to do is fill out a few form fields and the keyword will be in all of the important places. A tool can also analyze the overall optimization of the job ad, including how the job ad is indexed by search engines, checking the links in the ad, and checking the length of your meta description and SEO title. Would you like to learn more about how to optimize your job posts for SEO? We would be happy to show you best practice SEO examples and how the SEO tool works in the Talention software. Just ask for a free demo here and someone will get in touch with you shortly. Request a demo now.